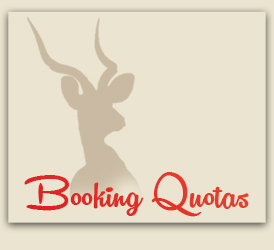 When a booking is made, the hunting group need to complete the hunting booking form and return it to Phirima Game Ranch by e-mail (phirimabots@gmail.com or thomasvanzyl@gmail.com) or fax it to +267 6540936. The purpose of this document is to secure animals for the hunting groups especially for the groups that will hunt later in the season. The numbers and species will only be reserved once the deposit for the hunt is paid. The banking details are appearing in the website.